Legit one of the most elusive parts of parenting. Few of us are getting it, and those of us that are, aren’t getting it often. What if we could really get a little more sleep a little more often. Probably give up a kidney for that level of awesome, only need one to survive anyway. And if your baby isn’t sleeping, you get that. You get the feeling of desperation that would allow you to sacrifice an organ for the opportunity to get some good, deep shut eye. If your baby isn’t sleeping, and let’s face it, no one’s really is, here are some things you might want to try to make your nights less sleepless. Problem: Overtired. Often, when your child is extremely tired, she may struggle to fall asleep when it’s time. Solution: Make sure you’ve set up a consistent nap schedule so your child is getting the sleep she needs throughout the day. Then, when bedtime rolls around your child will be ready for bedtime! Problem: Hungry. Even if your baby stopped eating at night, she may be going through a growth spurt, or possibly missed a meal earlier in the day. Problem: Overstimulated. It’s hard to get to sleep when you’re keyed up. Solution: Provide a calming atmosphere and consistent sleep routine so your child can go to sleep and stay that way. Problem: Not sleepy. It happens! Sometimes kids are just done sleeping. That’s why they’re up at the crack of dawn. Solution: Adjust your sleep time so you can deal. Go to sleep when baby does and wake up when baby does so you are able to get in the sleep you need too. Problem: She can’t put herself to sleep. 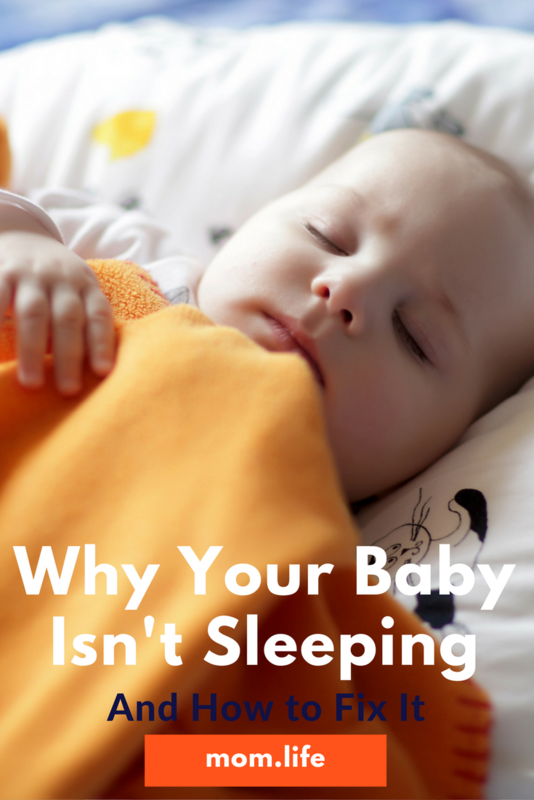 Your baby may be dependent on you to help her get to sleep. She needs rocking and patting and mommy’s arms. Makes it hard to get to sleep if you’re not there are available for putting in sleepy-time work. Solution: Help your baby learn how to put herself to sleep. You want to reduce the amount of time you spend in your child’s room each night putting her to bed, but you want to be gentle with her and allow her to adjust over time. Don’t just cold turkey her -neither one of you will enjoy that process. Problem: Inconsistency. This is a vote for schedules! They can make your life and your baby’s much easier. If your child is struggling to go to sleep or stay asleep, you may want to take some time to insert some consistency in your life. Set up a bedtime routine so that your child learns to expect what going to bed looks and feels like. Struggling with this whole new mom thing? Download our mom.life app and connect with other modern moms in the trenches.